How would you like to watch TV in a window while you work? How about using your computer as a digital VCR? Wouldn't it be nice if you could get all that plus great 2D and 3D acceleration on one card? 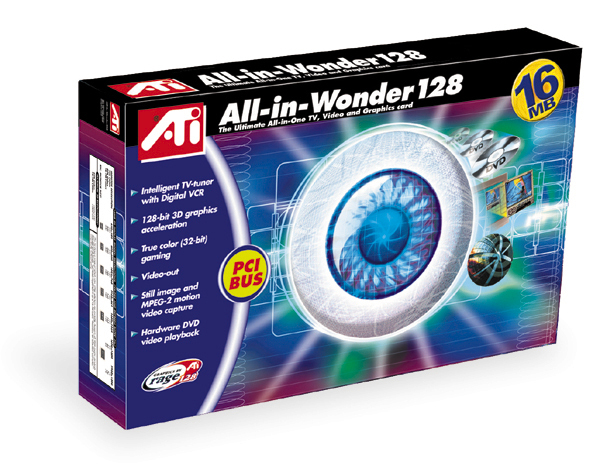 ATI hopes to make that dream a reality with their latest offering - the All-in-Wonder 128. As noted in AnandTech's Matrox Marvel G200 Review, it has been quite difficult for companies to successfully produce a multifunction device that excels in all areas. ATI's original All-in-Wonder Pro featured the Rage Pro chipset, which did a reasonable job as a TV tuner and 2D card, but fell flat on its face with weak 3D performance and support. Video capture support was reasonable, but the proprietary ATI VCR 1.0 or 2.0 format made the video unusable on non-ATI systems. The Marvel G200 came along and promised all the features of the All-in-Wonder plus greatly improved 2D and 3D acceleration thanks to Matrox's own G200 chip on board. While 2D support was great, 3D support was merely pretty good. The G200 excelled at high image quality with true 32-bit rendering, but the performance was not quite there. The real kicker was the lack of an OpenGL ICD, which was supposed to be delivered with the Mystique G200 upon its release. Matrox has only recently released a beta of that ICD that still is not fully optimized. Back in December, AnandTech took a look at a prerelease ATI Rage Fury board. It performed quite admirably, featured hardware DVD acceleration, and proved 3dfx wrong by providing only a minor performance penalty when 32-bit rendering was enabled. It seemed like there was finally a real competitor to nVidia's TNT. The Rage Fury was of course based around the Rage 128 chip from ATI, a company that had traditionally been a leader in OEM sales, but lagged somewhat behind the performance curve when it came to 3D acceleration. The Rage 128 was ATI's attempt to take back the lead in 2D and 3D performance. This .25 micron chip features a 128-bit engine, complete OpenGL ICD, hardware DVD decoding, and an "advanced graphics architecture with superscalar rendering, line and edge anti-aliasing, gouraud shading, twin cache architecture, single-pass multi-texturing and bump mapping." We all hoped that ATI would take the Rage 128 and combine it with the functionality of the All-in-Wonder series to create a new standard in multifunction devices. Well, it looks like it has finally happened with the All-in-Wonder 128. 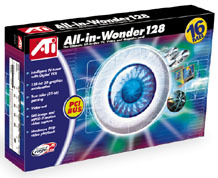 Fortunately for us, ATI did not just slap the Rage 128 into the old design, but has in fact implemented much greater functionality with the new All-in-Wonder 128.